Founded in Zurich, Switzerland from a revolutionary idea, a Swiss running shoe has evolved that is still amazing the sporting scene. On provides a new running sensation and one that puts fun firmly centre-stage. Here you can find all our content relating to the brand including On Running reviews, On shoe reviews, On running apparel and On accessory reviews, interviews with On sponsored athletes and race reports from On sponsored events. The On Cloudventure Waterproof 2019 is a durable all-round trail running shoe that will protect your feet from any weather/terrain that may come your way. The On Cloudventure has been given a huge design overhaul for 2019 which brings many welcomed improvements. Find out what they are, and why we love them! The On Cloudsurfer has been designed with speed and comfort in mind but it's also a very comfortable shoe that provides great cushioning for long runs too. Join our Strava Club with over 1,000 other runners who love trail running too. 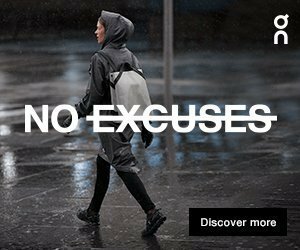 The On Cloud Waterproof is a really versatile running shoe for active people in urban environments, crafted to keep your feet dry on rainy days. A stylish Swiss-designed waterproof women's running jacket all the key features you need to protect yourself from all weather conditions while out running. I'm in love with everything about The On Cloud Edge Moonlight running shoe, from the design and color scheme right through to how comfortable it is. The On Weather Jacket is very stylish and definitely has all the key features you need to protect yourself from all weather conditions while out running! The women's On Cloud Waterproof is a stylish lightweight trainer for running or casual wear, which is waterproof and keeps your feet dry in wet conditions. On Cloud vs Cloud X 2019: Which On Running Shoes Are The Best? On Cloud vs Cloud X: We've reviewed both these running shoes in detail so here's our side by side comparison of them. Find out which shoe we prefer! On Cloud 2018 Review: My 'go-to' lifestyle and 'on the move' shoe, where other trainers just aren't stylish enough for me to want to wear them all day, at work or when heading to the city. There's no denying, the On Cloudace shoes are capable of allowing you to run long distances in extreme comfort but are they worth the premium price tag? The on Cloud X is marketed as the world’s lightest fully-cushioned shoe for running Remixed. I'm calling it their BEST road running shoe yet! Find out why! On Cloudrush vs Cloudflow 2019: Which On shoes are best? Read our review of the On Cloudventure Peak. The lightweight trail competition shoe with downhill cushioning. For me, It's all about feeling as minimal as possible while running. Fast and Light! Whether on the trails or off them. The On Cloudflow does both! On Running Lightweight Cap Review - "I love to see how new technologies and innovative thinking can make something as simple as a hat, better."